For purposes of testing and verifying the calls you make in the Native & Search API, you may wish to set up the Postman HTTP client, which lets you make requests (GET, PUT, POST, and DELETE calls) to the Native & Search RESTful APIs. Postman is a widely used tool for building and handling HTTP requests to REST-based services. It can be useful in your development efforts for optimizing, testing and error-checking your API calls when working with the programmatic Native & Search API. Follow the steps outlined in the sections below to get started. You can install Postman as a Chrome, Windows, Linux or MacOS app. The best strategy for working with Postman is to get the desktop client. The Chrome version, however, will run on any platform and is identical in functionality and appearance. To work successfully with the Native & Search API Postman collection, you will need to update your Postman environments. Global variables are used here, so you don’t have to update each call separately, but instead, you can simply update one value. Click the gear icon in the upper right corner of Postman and select Manage Environments. Click Add to create a new environment. 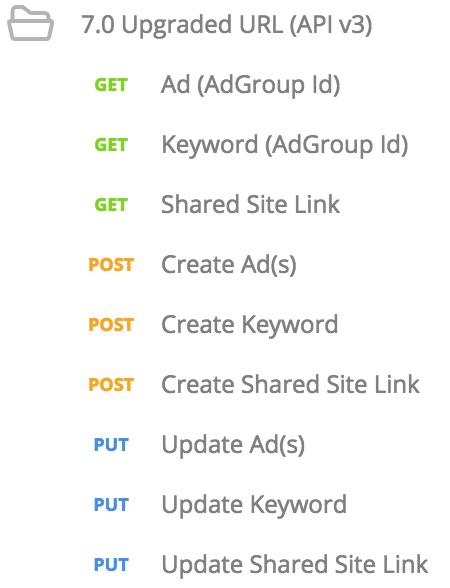 advertiser_id Your Native & Search Advertiser ID. 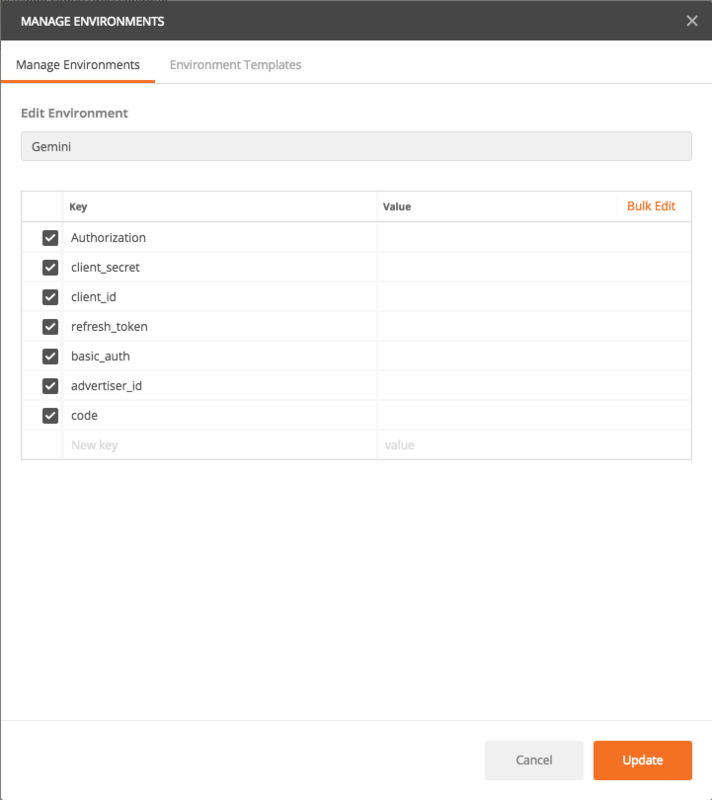 Enter the values for Native & Search in the Postman Manage Environments panel, shown below. Once you’ve completed the entry of your Key/Value pairs, click Add. The only variables you will need to update to continue testing with the Native & Search API Postman collection is your authorization and refresh tokens when your access access_token and refresh_token expires. You can get access to the Native & Search API collection by simply clicking the button and selecting which version of Postman you have. After that, Postman will automatically open and ask you to import the collection. 19 October 2017: The postman collection has been updated to the v3 endpoint for all calls in order to stay in parallel with YDN. 7 August 2017: Added new Upgraded URLs (v3 Native & Search API) and Bid by Site (v2) examples for the Postman collection, shown below. 17 July 2017: Added bearer in front of the authorization for each call, making it easier to paste in the authorization token in the global variables. Download the latest version of the Postman collection from the same link to see this feature enabled.